Whacky Thursday indeed. The Science is fun, the forums on the Internet are scary and rude. And it is simply interesting to realize what we all see . NOTE: None of the forums or the original approach are professional in tone or appearance and as such are not approved for use or reference in the class. Not since Monica Lewinsky was a White House intern has one blue dress been the source of so much consternation. The fact that a single image could polarize the entire Internet into two aggressive camps is, let’s face it, just another Thursday. But for the past half-day, peopleacross social media have been arguing about whether a picture depicts a perfectly nice bodycon dress as blue with black lace fringe or white with gold lace fringe. And neither side will budge. This fight is about more than just social media—it’s about primal biology and the way human eyes and brains have evolved to see color in a sunlit world. We asked our ace photo and design team to do a little work with the image in Photoshop, to uncover the actual red-green-blue composition of a few pixels. That, we figured, would answer the question definitively. And it came close. In the image as presented on, say, BuzzFeed, Photoshop tells us that the places some people see as blue do indeed track as blue. But…that probably has more to do with the background than the actual color. “Look at your RGB values. R 93, G 76, B 50. If you just looked at those numbers and tried to predict what color that was, what would you say?” Conway asks. “Right,” says Conway. “But you’re doing this very bad trick, which is projecting those patches on a white background. 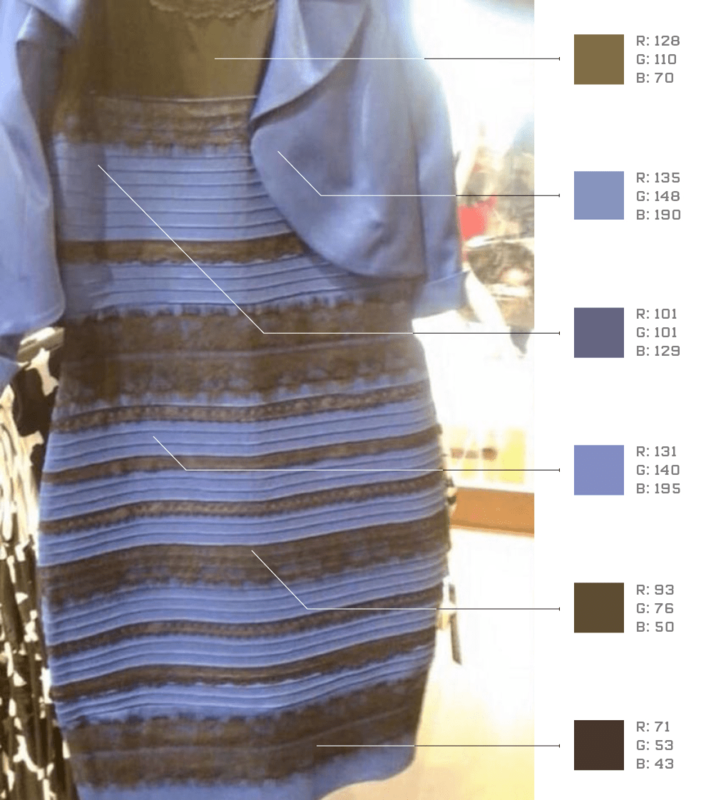 Show that same patch on a neutral black background and I bet it would appear orange.” He ran it through Photoshop, too, and now figures that the dress is actually blue and orange. Even WIRED’s own photo team—driven briefly into existential spasms of despair by how many of them saw a white-and-gold dress—eventually came around to the contextual, color-constancy explanation. “I initially thought it was white and gold,” says Neil Harris, our senior photo editor. “When I attempted to white-balance the image based on that idea, though, it didn’t make any sense.” He saw blue in the highlights, telling him that the white he was seeing was blue, and the gold was black. 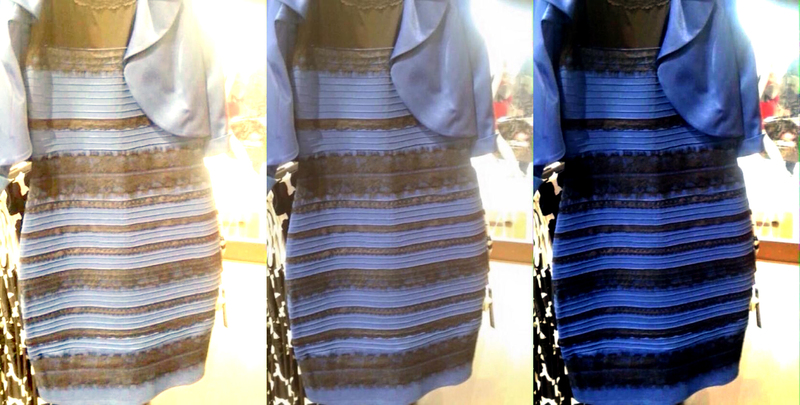 And when Harris reversed the process, balancing to the darkest pixel in the image, the dress popped blue and black. “It became clear that the appropriate point in the image to balance from is the black point,” Harris says. So when context varies, so will people’s visual perception. “Most people will see the blue on the white background as blue,” Conway says. “But on the black background some might see it as white.” He even speculated, perhaps jokingly, that the white-gold prejudice favors the idea of seeing the dress under strong daylight. “I bet night owls are more likely to see it as blue-black,” Conway says. At least we can all agree on one thing: The people who see the dress as white are utterly, completely wrong. When Do I Use a JPEG, GIF, or PNG?